Hey all! We’ve been hard at work over the summer building and launching a new iOS app that just landed in the Apple App Store. Behold, Day of the Shirt 2.0, new and improved and – as always – free to download. Now you can browse and find your favorite shirts. Fast. Our app boasts a new interface that’s flat, modern, and ready to enjoy. 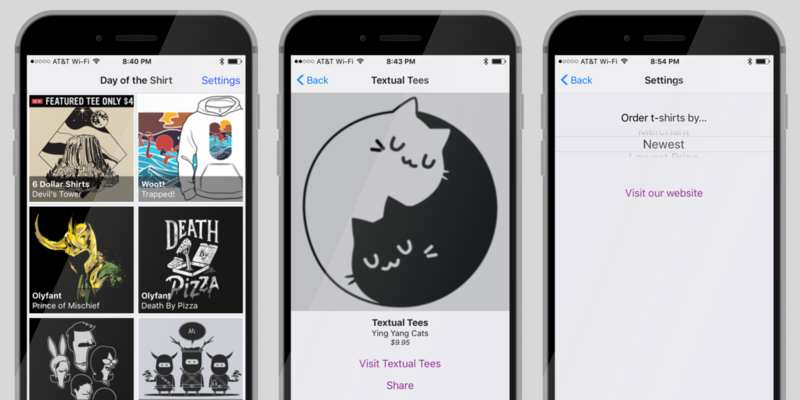 Swipe left or right to browse shirt designs up close, view artist and merchant details, and see the price all in the same view. Find the same great deals in the app as on our website, and sort shirts by merchant, the lowest price, or by how new the listing is. Got questions or feedback? We’d love to hear from you. Drop us a line [email protected] or, heck, leave us a review in the App Store.